Ben Shoulders praised the youngsters making the step up in to the Mile Oak Football Club first team after they bagged a derby victory over rivals Steyning Town on Saturday. 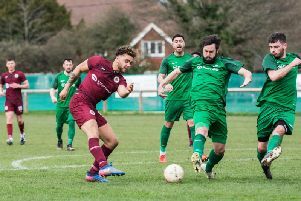 Jamie McKenzie was at the double, making it six goals in three matches, while Albert Ellis and substitute Remi Coates both struck as Oak secured a routine 4-1 Southern Combination League Division 1 triumph at The Shooting Field. McKenzie’s early opener was quickly cancelled out by an Dominik Ozga strike before Mile Oak took control. Oak boss Shoulders, whose team have been hit by injury and unavailability of late, has been impressed by the young guns at the club making appearances in the first team. He said: “It was a great result for us. Lots of youngsters are making the step up at the moment and playing really well. In-form striker McKenzie slotted home his fifth goal in three matches as Oak went ahead after 15 minutes. Steyning were back on terms within four minutes, with Ozga on hand to poke home at the back post. Oak goalkeeper Aaron Stenning pulled off a string of fine saves to keep his team level. McKenzie then bagged his second in first half stoppage-time to fire Mile Oak ahead once again. Sheldon headed in a first senior goal for the club eight minutes after the restart, before substitute Coates rounded off the scoring. Having used all three substitutions, Steyning were forced to see out the final few minutes with ten players after Johnny Taylor was forced off with a shoulder injury. Town head coach Gerry Murphy felt his side deserved better and said: “Johnny (Taylor’s) late injury, forcing us to see out the final few minutes with ten players, pretty much summed up our day. We had chances but things didn’t go our way. Mile Oak’s home SCFL Division 1 clash with rivals Southwick was postponed on Easter Monday owing to a waterlogged pitch. Steyning Town hos neighbours Storrington in the league this evening (7.45pm). STEYNING TOWN: Rose; Clark, Cockerton, Spence, Stevens, Towse, D.Taylor, McGrath, Townley, Ozga, Al-Samaraie. Subs: Philips (Towse), Pittock (Ozga), J.Taylor (Al-Samaraie). MILE OAK: A.Stenning; Early, Ellis, Stideford, Gillingham; E.Benn, Sheldon, Austin-Slade; Marriott, McKenzie, Watts. Subs: Phadagi (Marriott), Coates (Watts), Wells (McKenzie).